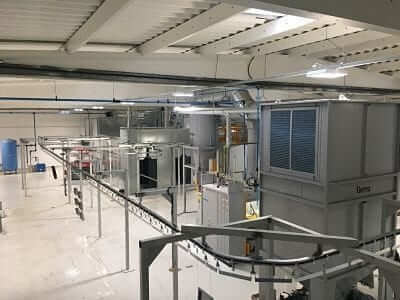 TD Finishing Ltd suppliers of Finishing plants have installed a new Powder Coating system at Lasershape Ltd.
Based in Chilwell, Nottingham, Lasershape a company specialising in laser and water jet cutting have expanded in to the Powder Coating market. The new powder coating system occupies a building adjacent to the existing Lasershape site and consists of an online 5 stage spray pretreament, single pass drying oven, Gema colour change booth, two pass powder curing oven and a medium duty side track conveyor system. The plant operates at a speed of 1500mm/min and can handle products up to 3000m in length x 800mm width x 1500mm high with a conveyor weight capacity of 240kg. Utilising the environmentally friendly high performing Chemetall Oxsilan process, the plant can treat multi metals and has a salt spray performance in excess of 1000hrs. This gives Lasershape, probably one of the most modern and up to date powder coating plants in the East Midlands. The complete spray pretreatment plant is constructed for stainless steel and incorporates high efficiency small bore burner system to heat the Alkali Cleaner to the 50⁰c operating temperature. Stainless steel pumps with high efficiency motors, spray the products at pressures up to 1 bar. CPVC spray rings with clip on spray nozzles and cam action spray pipe connectors ensure that work is processed to high standards before the application of the powder coating. A reverse osmosis plant produces the demin water required for the Oxsilan process without the need for any acid or alkali chemicals needed for conventional ion exchange demin systems. After the products are dried, powder application is carried out in a GEMA automatic quick colour change booth. The Powder Coating oven consists of a two pass oven operating at 200⁰c. Both the powder coating and drying ovens have the most up to date gas and air modulating burners, ensuring both operate in most efficient manner possible.